Barrel racing is a competitive speed event that requires horses and riders to race in a cloverleaf pattern around three free-standing barrels. Choosing the right size of saddle to ride is crucial to your ability to train and to perform well during barrel racing competition. Your saddle must fit your properly and aid you in staying securely seated on your horse's back during the race. Barrel saddles, and all other western saddles, are measured using standard seat size. The seat size relates to the size of the rider rather than the size of the horse. Barrel saddles are most commonly sold with 14-, 15- or 16-inch seats. Saddles with seats less than 14 inches are considered youth saddles. Barrel saddles with seats that are larger than 16 inches are larger than average; they may require custom ordering. 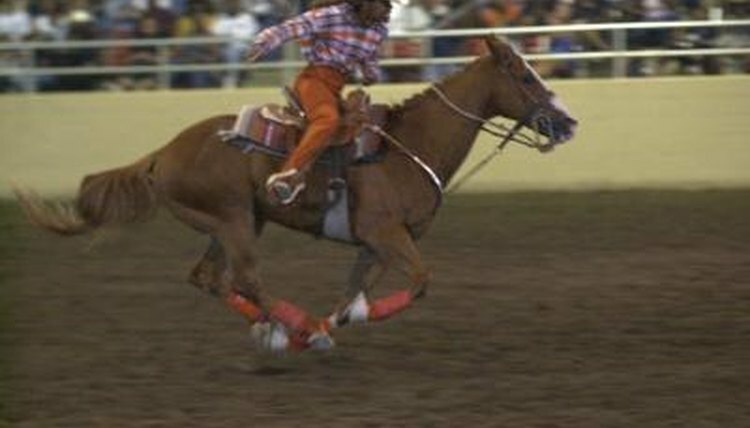 The general design of the barrel racing saddle is not intended to accommodate a large seat area for the rider, focusing on a tight seat with minimal extra space. If you do not know what size of seat a barrel saddle has, measure it. A normal measuring tape works fine for measuring barrel racing saddles. Place the end of the measuring tape in the center of the front of the saddle's pommel, directly below the horn. Stretch the tape in a straight line to the center of the back of the seat, the cantle. The saddle size equates to this measurement of the length of the saddles seat in inches. For example, if there are 15 inches between the center of the pommel and the center of the cantle, the saddle is a 15-inch saddle. The size of your barrel saddle's gullet is important in determining whether it will fit your horse appropriately. While barrel saddles are not classified by gullet size, you will have to select a saddle with the right gullet size to get the best fit for your horse. The gullet is located at the front of the saddle. It is the area of clearance between the bars of the saddle and the underside of the pommel, which is the front of the saddle where the horn is located. If you are looking straight at the front of the saddle, the gullet is underneath the horn and between the two sides of the saddle. The size of the bars indicate the width of the combination of the gullet and the tree, which determines how the saddle sits when in use on the horse's back. Measure the gullet by stretching a measuring tape from concho to concho across the front of the saddle, not over the top. Saddles with semi-quarter horse bars usually have gullets of 6 1/2 inches to 6 3/4 inches, while those with full quarter horse bars will feature gullets of 7 inches.